Bry-Air, Inc. environmental control systems allow for consistent and quality products to be produced efficiently by preventing the effects of humidity. Hard candies often contain corn sugars and sorbitol, both of which are highly hygroscopic. When humidity is high, the product can absorb moisture and become sticky, which can cause it to stick to the packaging machinery and wrapping material, slowing the process and creating sanitary problems. Any coated candy like gumballs or chocolate-covered nuts can benefit from using dry air to speed drying. In the case of chocolate, high temperatures would melt or dent the products. With gumballs, the gloss of the coating is enhanced by using dry air, and the product is less likely to stick together in the coating pan. In general, the highly hygroscopic nature of the ingredients in most candies makes them sticky, runny or moldy when exposed to humid conditions. This inhibits natural flow as the material sticks to high speed processing and packaging machinery and wrapping material, thus slowing the process and creating hygiene problems. 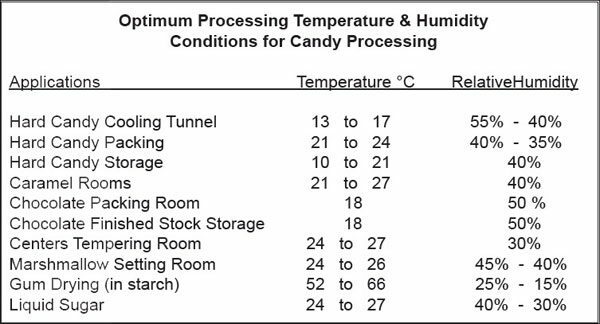 The chart below lists optimum design air conditions for several candy manufacturing processes. The marketing season of the candy. The stability of the candy (based on proper manufacturing conditions). The storage temperature and humidity conditions. Candies remain firm as an assurance against sticking to the wrapper or being smashed. Loss of color, aroma and flavor is reduced. Insects are rendered inactive at temperatures of 9°C or lower. The tendency to become stale or rancid is reduced. Candies can be manufactured year-round and accumulated for periods of heavy sales. The solution to the problem lies in surrounding the processing, packaging and storage areas with cool, dehumidified air. Bry-Air, Inc. has worked with candy manufacturers throughout the world to provide cost effective solutions for their processing and storage needs. Some of our customers include: Wrigleys Gum™, Marich Confectionary™, Hershey™, Leaf Candies™, and Nestles™.